Ophélie: un état d’âme (introduced in my previous post) continues to evolve as I gather up the scattered pieces that were lost, or migrated over to other projects. Today while organizing folders I found an old file and decided to have another go at it. The image was originally comprised of a mask (photo from one of my old acrylic paintings) superimposed over the woman’s face with one of the old boxcar photos as a background. It was pretty awful, but I was determined to make it work. In the end, I ditched the mask and sandwiched the woman between two duplicate layers of the boxcar. Bam! Ophelia is totally cracking up! While Craquelure is quite different than most of the previous works associated with this project, there’s just something about it. Maybe it’s a reminder that as humans, all of us are composed of many complex layers – layers of ourselves that we construct and deconstruct over time. We build them up, we peel them off, and sometimes they just fall off all by themselves without us even noticing. Click here for more photos and details about this intriguing project, or go to Ophélie: un état d’âme in the drop-down menu under Projects at the top of this page. Thanks for dropping by. 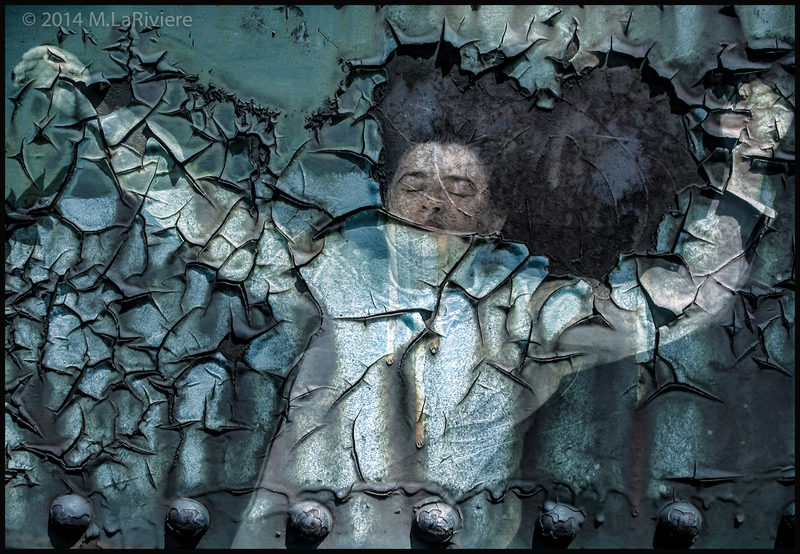 This entry was posted in Art, Photography, Projects and tagged Boxcar, Chipping, Cracking, Craquelure, Digital Collage, Hamlet, Layers, Metaphors, Ophélie, Ophelia, Photography, Photomontage, Photoshop, Shakespeare, Trains. Bookmark the permalink.